The blast damaged parked cars and facades of buildings. 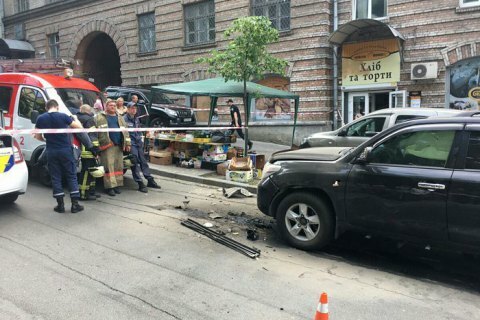 A man was wounded on Friday in a car explosion in central Kyiv at the crossroads of Turhenivska and Poltavska streets in Kyiv's Shevchenkivsky district, the metropolitan department of the National Police said in a release. "The explosion has badly damaged the front part of the SUV. As a result of the explosion, a man born in 1970 was wounded. He was provided medical assistance," the report said. According to Censor.net, the wounded is Herman Haiduk, a Sevastopol developer. The police said the explosive device was planted under the driver's seat. Criminal proceedings are underway on suspicions of an attempted murder. On Wednesday, 21 June, an explosion took place at night near a store in Kyiv's Shevchenko district.